The Queensland Government has announced an extension to the Energy Savers program with up to 200 more energy audits, and up to $20,000 in matched funding to implement recommendations from the audits. The Energy Savers audits have so far identified over $3M in savings with a payback period of five years or less. Over 60% of the 130 farms participating in the program have acted on the recommendations or plan to in the near future. Energy audits look at overall farm energy consumption, and can look for efficiencies in specific areas such as irrigation, packing, refrigeration, heating, cooling, ventilation and lighting. 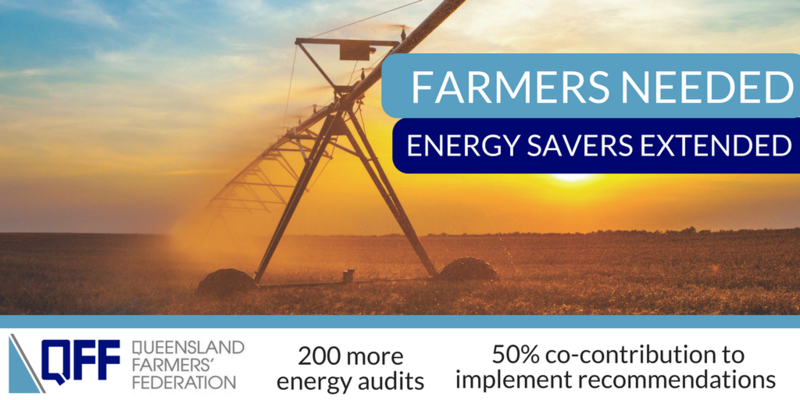 An energy audit will help to find cost-saving energy efficiency opportunities on farm, and the matched funding will help with the funds to go ahead with the projects identified in the audits. Apply today for the expanded Energy Savers program HERE. Details of the program as well as a similar program for large energy users are available on the Department of Energy and Water Supply website HERE. The Energy Savers Program is funded by the Queensland Government and delivered by Ergon Energy in partnership with the Queensland Farmers’ Federation and its members.